Posted in General Health & Wellness on June 13, 2012. Last modified on April 23, 2019. Read disclaimer. All humans yawn. So do most mammals and even some birds and reptiles. Because yawning is not a serious problem, however, little research has attempted to uncover exactly why we yawn. The hypothalamus part of the brain that plays an important role in yawning. Some neurotransmitters (e.g., dopamine, excitatory amino acids, nitric oxide) and neuropeptides increase yawning when injected into the hypothalamus of mammals. The average length of a yawn is approximately six seconds. The earliest a human has been shown to yawn is at about 11 weeks gestation, well before birth. Between the first and second years of life, yawns become contagious. Scientists have confirmed that boredom increases yawning. In an experiment with 17 to19 year-olds, teens who were able to watch a music video yawned significantly less than those who could only watch the colored test pattern on a television. An unexpected finding was that yawns of male teens were longer than those of female teens. So, why do we yawn? Theory 1: People yawn when they are bored or tired. When we breath more slowly, such as what happens when we're tired or bored, the oxygen in the blood decreases and carbon dioxide levels increase. A yawn may be the body's way of gaining more oxygen as if "taking a deep breath." The problem with this theory is that research has not supported it. If anything, the research suggests there is no relationship between carbon dioxide levels and yawning. 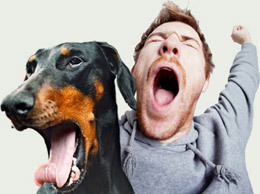 Research concluded that yawning and breathing may be controlled by two separate mechanisms. Theory 2: Yawning provides a stretch of muscles automatically. Both yawning and stretching increase blood pressure and heart rate and also flex the muscles and joints. Have you ever observed what happens when you try to stifle a yawn? It's like an unfinished, unsatisfying stretch. For reasons still unknown, in order to produce a good yawn, the face and jaw muscles must be stretched to a certain degree. Theory 3: Yawning cools the brain. Researchers have found that we yawned more often in warm rooms. We also yawn more with a room-temperature towel placed on our head than if the towel is cool. People who breath through their noses are also less likely to yawn. Why do yawns seem to be contagious? It could be thay yawning served a social function early in our evolutionary history. When one member of a group yawned to signal some sort of change, the rest of the group also yawned. This leftover or "vestigal" response is no longer needed yet yawns remain "contagious." It is estimated that about 40-60% of people are susceptible to contagious yawning. Research has shown that those with schizophrenia-related disorders and people with problems of self-awareness were less susceptible to contagious yawning. The ability to see things from another's point of view is also related to contagious yawning. Researchers believe that, "seeing or hearing about another person yawn may tap a primitive neurological substrate responsible for self-awareness and empathic modeling which produces a corresponding response in oneself." Animals such as orangutans, and chimpanzees, who are capable of self-recognition and mental state attribution are highly susceptible to contagious yawning. Modern science has brought us a long way toward solving the mystery of yawning but, for now, the exact mechanism of yawns will remain an unsolved mystery.